Several front-of-pack or supermarket-shelf nutrition labeling programs use scoring systems to rate food products. ... and the NuVal system used by some other supermarket chains. The computation of the scores seems fairly arbitrary to me. It might help to start with some basic mathematical principles. Here are three principles that I think a food scoring system should satisfy. 1) The score should not depend on the serving size. A major limitation of all such scoring systems is that our health really depends on how much of each food we eat, and in what combination. Unfortunately, the scores necessarily apply to each food as it sits on the supermarket shelf, not as we consume it. Because the creators of the score have no knowledge of how much we eat, the score should be treated as a description of the density of good and bad nutrients per unit of weight or food energy. The score should not depend on the serving size convention used or the number of servings in a package. I have seen some scoring systems that appear at first glance to be independent of the serving size, but on closer inspection have quirky limits on total daily nutrients per serving that contribute to the score. Without this principle, the scoring system will be biased in favor of or against manufactured mixed foods in place of separate ingredients. I think a good scoring system would have no such prejudice. 3) The score should rate each good and bad nutrient independently. Suppose adding 20% more salt to a high-fiber food reduces the score by 20%. How much should adding 20% more salt change the score for a low-fiber food? Many of us would say the score should again change by 20%. Unfortunately, existing scoring systems may have strange interactions across the good and bad nutrients, so that the effect of one nutrient on the score depends on the value of other nutrients in a way that the authors probably did not intend. Currently, the scoring systems seem to me to have an ad hoc quality that makes it difficult to take the quantitative scores very seriously. Broadly speaking, a scoring system may seem to work correctly in giving healthy foods a good score, and unhealthy foods a bad score, but consumers understood those broad outlines of their food options already even without a scoring system. The whole purpose of a scoring system is to add quantitative rigor to the information provided. They may have a long way to go. In other recent reading on front-of-pack labeling, see the recent series by Timothy Lytton at the Fooducate blog. In general, Lytton suggests that FDA should not get into the business of developing its own front-of-pack system, but instead should just enforce existing rules against making implicit healthy claims for foods that fail to meet FDA's definition of "healthy." One exception to Lytton's hands-off recommendation is that he feels there may be a need for stronger regulation of the complex scoring systems. Thanks to Aliza and Ashley! Let me say a word of thanks to long-time co-bloggers Aliza Wasserman and Ashley Colpaart, who have each been moving on to new adventures and posting less frequently in this space. Aliza, an alum of the Friedman School, now works for the Boston Public Health Commission. Ashley is completing her M.S. 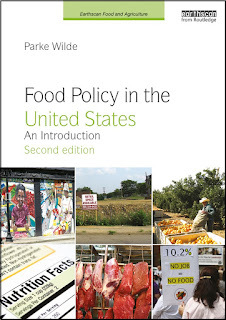 in Food Policy and Applied Nutrition, while also doing terrific work for the Hunger and Environmental Nutrition practice group of the American Dietetic Association. We may hear from each of them in guest posts in the future, I hope! Friends and family are emailing me from around the country, asking me to explain how my seemingly liberal commonwealth just elected a Republican Senator in yesterday's special election, thereby jeopardizing the health care legislation that was the life legacy of beloved Massachusetts Senator Edward Kennedy. You can read others for careful poll numbers. I'm just giving my impression. Briefly, it is true the Massachusetts is about 80% liberal by national standards, and only about 20% conservative. That makes Massachusetts much more liberal than most states. But the liberals are deeply divided. One half has working class and pro-union roots in manufacturing, construction, and government service industries, which are all suffering painful economic stresses. The other half is connected to the large higher education, financial service, biomedical, and software industries. The Democratic candidate, Attorney General Martha Coakley, is a highly educated lawyer who failed to reach out well to liberals with working class roots, who are genuinely fearful about economic conditions. All conservative voters went to the polls yesterday, while some fraction of liberals stayed home. Republican candidate Scott Brown compiled a coalition of conservatives (perhaps 30% of all voters yesterday) and some portion under half of the liberals with working class roots (gaining Brown 15% of all voters yesterday). His last 6% of all voters liked his good looks and pickup truck. The lesson I draw is that highly educated liberals in comparatively high-paying industries should steadily attend to the health of their political networks and friendships across all types of people in their communities. Don't just run with your own crowd. USDA seeks public comments by February 16 on the department's Environmental Impact Statement (EIS) (large .pdf) for genetically modified alfalfa. Participate in our democracy and let USDA know your view on this technology. The background is that USDA in 2004 approved Monsanto's technology for genetically modified (GMO) alfalfa, which is resistant to the pesticide glyphosate (such as Roundup Ready sold by Monsanto). Previously, Roundup Ready was deadly to alfalfa and weeds alike, and was sometimes used at the end of the season to clear a field of alfalfa. With the new technology, farmers could use Roundup Ready more widely to kill the weeds while protecting the alfalfa. The federal government has traditionally claimed that GMO technologies are substantially equivalent to conventional technologies. USDA had previously conducted a shorter environmental assessment but had claimed that no longer and more formal EIS was required. In response to a 2006 lawsuit, USDA was forced to conduct the full Environmental Impact Statement. The draft statement was published in December, and the comment period is now open. The draft EIS says the new technology is mostly safe for the environment, but it does acknowledge what it describes as a small probability that genetically modified genes will contaminate non-GMO fields of alfalfa. This possibility threatens the markets for organic alfalfa and organic dairies that use alfalfa feed for cows, because the certified organic label requires using non-GMO technology. This possibility also threatens U.S. export markets for dairy, because consumers in other developed countries are reluctant to consume GMO foods. The draft EIS says Roundup Ready is not very dangerous for animals who live in or near alfalfa fields. It says Roundup Ready (like any herbicide) may pose some risk for threatened and endangered terrestrial and acquatic plants. The EIS says these risks can be mitigated by good application practices, and it also essentially says the new GMO technology is not to blame, because, of course, other herbicides also endanger plants. That's what herbicides do. Overall, the draft EIS says the GMO alfalfa should be approved. For another view, Food & Water Watch, an environmental and food safety group that opposes GMO technologies fairly broadly, has a web page with suggested themes for public comments. USDA is holding a series of public meetings around the country to discuss the Environmental Impact Statement. Despite the Central American Free Trade Agreement (CAFTA) a year ago, the Tico Times in Costa Rica reports that the United States is refusing to lower trade barriers to imported sugar, because Costa Rica has not yet changed its copyright laws to implement a controversial provision that protects U.S. intellectual proprty rights (see also boingboing). In principle, export oriented economic development is one of the most promising strategies for a small country seeking to overcome long-term poverty. In practice, the United States and other rich countries have been making it difficult for pro-trade advocates to explain the merit of this strategy to their compatriots. In return for offering to lower our own barriers to trade, it seems fair for the United States to ask small poor countries to lower their own barriers to trade in a comparable way. That is the quid pro quo that makes trade agreements work. However, I can see why people in Central America would object to onerous observance of U.S. copyright provisions. Free flowing information seems like one of the most sensible ways to give countries that are currently poor a chance to learn the technologies that made the developed countries rich. That type of learning makes the whole world better off, and increases the whole world's chances of a peaceful, sustainable, and prosperous future. A new study in the Journal of the American Dietetic Association shows that many grocery and restaurant foods understate their food energy (calorie) contents by 8% to 18% on average. Some restaurant items had double the stated calories. The study, by Prof. Susan Roberts and several other colleagues here at the Friedman School of Nutrition Science and Policy at Tufts, concluded, "this phenomenon could hamper efforts to self-monitor energy intake to control weight." For interesting coverage, see Marion Nestle, Time Magazine, Slate's Explainer, and Food Navigator. Forbes Magazine this month named Monsanto as "Company of the Year." Monsanto's business model employs the company's monopoly on several lines of genetically modified crop seeds to extract an unusually large fraction of the producer surplus earned by corn and soybean farmers. The seeds grow corn and soybean plants, which have pesticidal properties or which can tolerate especially large applications of the chemical pesticide glyphosate (Roundup). Roundup, of course, is sold by Monsanto. That business model is profitable, but it does not usually win praise from others. So, Monsanto's public relations folks spend endless hours promoting products that have not yet been marketed successfully, which some day may end world hunger, repair the environment, or reverse obesity and chronic disease. Stops heart disease? For starters, let us look for the statement on omega-3 fatty acids in the Food and Drug Administration's page about health claims that have significant scientific agreement. No wait, omega-3 and fish oil claims are not there, because the evidence is too weak. So, let us look on FDA's page about second-tier "qualified" health claims that have mixed scientific evidence, and which are permitted only because the Supreme Court restricted FDA's ability to regulate claims that might perhaps maybe come true. Here, we find that fish oil merits a qualified health claim. If Monsanto made this claim on a label, the company would have to state the claim's evidence base in "supportive but not conclusive research." Instead of such frankness, wouldn't it be nice for Monsanto if it could instead convince Forbes to carry the message that the product will "stop heart disease." Even if you believe the fish oil health claim, which many people do, Monsanto's genetically modified technological marvel would achieve the same outcome that you already have available in a common dietary supplement. Forbes' adoration of Monsanto is not the unanimous view of the business media. Here is Jim Cramer's more insightful summary last Fall of Monsanto's business and policy risks. I use this video in my teaching, in a class session on imperfect competition in the food industry. You recall the dynamic chart showing each state's Supplemental Nutrition Assistance Program participation (in percent, on the vertical axis) as a function of the state unemployment rate (in percent, on the horizontal axis). I just added the new fiscal year 2009 data (running from Oct 2008 to Sep 2009). Including the new year of economic crisis, the last few moments of this story make me jump out of my chair. Hit play. Here is the national time series of monthly data. Following on last month's maps of SNAP participation, a New York Times story this month provides more information about the central role of SNAP in the overall social safety net.